Expedia Inc. has begun selling Cuba hotel rooms on its branded sites, including Expedia.com, Orbitz, Hotels.com and Travelocity. "We have been working around the clock with Cuban hoteliers to offer this destination to our global consumers, with the added convenience of online booking through a trusted travel partner," said Demetrius Canton, Expedia's director of market management for the Caribbean. Expedia.com lists 482 hotels in Cuba in 12 cities, with Havana topping the list with 123, ranging from apartments and guest houses to private residences, villas, inns and hotels in price ranges from $75 to more than $300 per room. A random search showed many selections sold out for much of June into early July. Cuba received more than 4 million visitors in 2016, up 6% over 2015, according to the Cuban Tourism Ministry. Of that total, U.S. visitors accounted for more than 614,000, a 34% jump. As of May 3, the country had already recorded 2 million visitors. Cuba's goal is 10 million annual visitors by 2030. Tue May 16, 2017 8:35 am (PDT) . located in Havana and CamagÃ¼ey provinces, respectively. (Las Tunas), Havana and Santa Lucia. alliance with experienced foreign chains. destination in the recent International Tourism Fair. Blau, Iberostar, Breezes and Blue Diamond. May 16 The annual Latin American Hotel and Tourism Investment Conferences meeting opened in Havana this week and the list of sponsors read like the who’s who of the U.S. hotel industry. The head of the organization, Arturo Garcia, told Reuters it was no accident that the likes of Marriott, Hilton, Hyatt, Choice and Wyndham were supportive. “The next step in the development of the hotel business in Cuba is the participation of the U.S. companies here,” he said. The event is the latest indication, following the signing of agreements earlier this year by major cruise companies, that the U.S. hospitality industry is betting that hotel operator and now President Donald Trump will not shut the Cuba door on his industry peers. “We are very interested in Cuba as a destination for our guests,” David Tarr, senior vice president for real estate and development at Hyatt, said on Tuesday. "Certainly we hope relations will be normalized. Our guests want to visit, which is why we are here." On the eve of President Barack Obama's historic visit to Cuba last year, and after obtaining a special Treasury Department license, Starwood became the first American hospitality company in more than half a century to operate a hotel, Four Points Sheraton, on the island. “Most sponsors are waiting for this same approval and when they get it you will see their hotels all over the island,” said Garcia, the conference president. U.S. travel to Cuba has already surged, albeit from very low levels, since the former Cold War foes announced a detente and the Obama administration eased travel restrictions beginning in 2015. Cuba reported 4 million arrivals last year, of which 285,000 were Americans, with their numbers increasing at a rate of 18 percent so far in 2017. 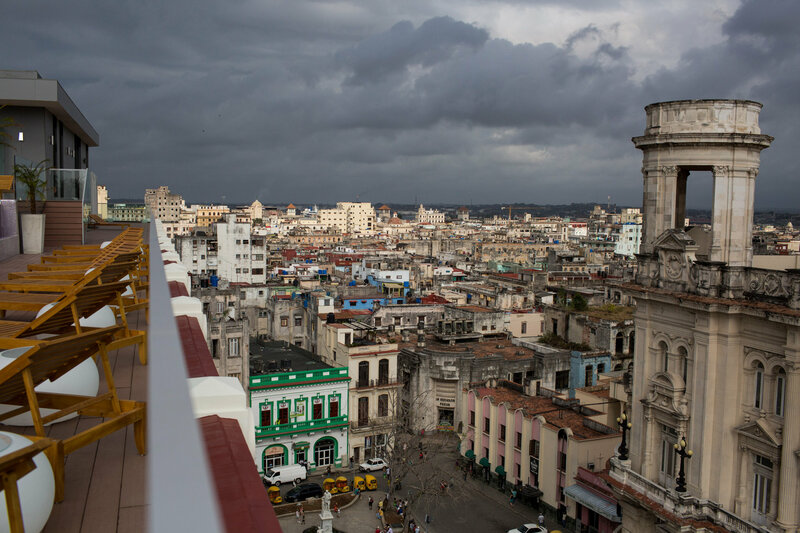 World Travel and Tourism Council President David Scow said European and Canadian firms had helped attract and lodge their nationals when Cuban tourism opened up after the fall of the Soviet Union and it made sense the United States would follow. “The U.S. market is opening up so you will see the U.S. companies invest once everything is ready in terms of the documentation (U.S. regulations),” he said. Louis Alicea, Wyndham’s Latin American and Caribbean development director, said he hoped U.S. constraints would loosen further. “Slowly but surely we are learning about the conditions here and our company is working together with the U.S. authorities in this process,” he said. HAVANA — In Havana’s Parque Central, shady stone benches and graceful palm trees beckon to mojito-sipping tourists and locals gathering to shoot the breeze. The gathering spot, in the center of town, is surrounded by horse-drawn carriages and long lines of colorful finned-and-chromed 1950s cars. But more utilitarian vehicles have recently begun circling the square: construction equipment transforming old buildings into luxury hotels. As Cuba’s relationship with the United States grows warmer, real estate redevelopment is heating up, too. President Raúl Castro’s loosening restrictions on private enterprise, improving relations with the United States and financial necessity — Cuba’s gross domestic product shrank in 2016, for the first time in over 20 years, according to official figures — have fueled rapid change in many areas. And several obstacles lie between the pent-up demand and a successful liftoff of Cuba’s luxury hotels. Utilities are not always reliable, poverty is widespread and visible, and even getting ingredients for restaurant-quality meals can be dicey. 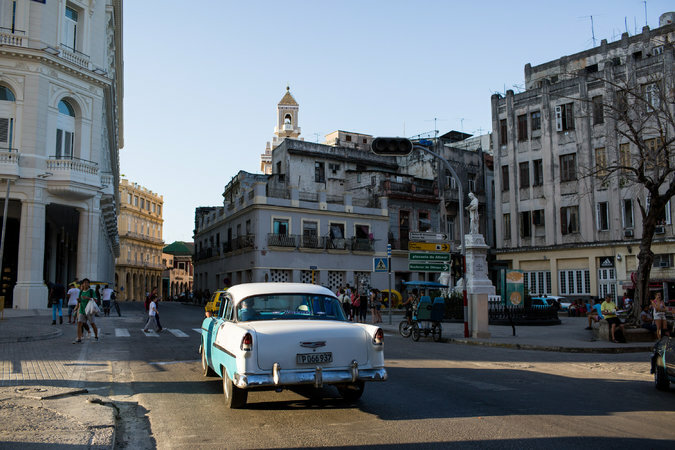 But with Cuba suddenly an option for Americans exploring a culture kept off-limits for decades, the hospitality industry in particular has been supercharged. Over four million tourists visited in 2016, up 13 percent from the previous year, according to the Cuban Ministry of Tourism. Among those visitors were over 614,000 Americans, up 34 percent from the year before. The area around Parque Central has a front-row seat for the struggle, and the potential payoff. 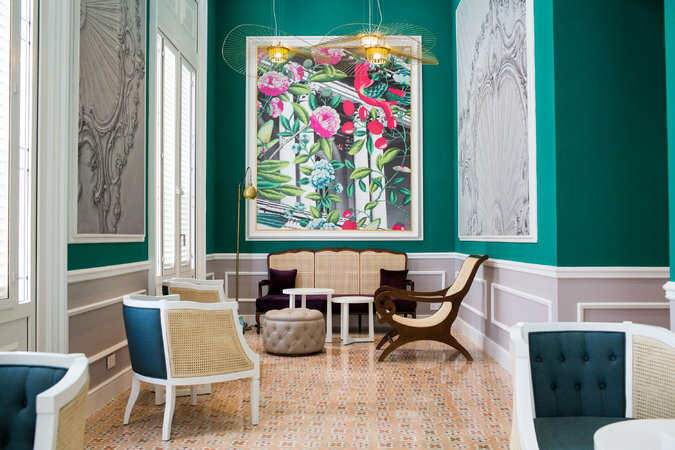 Leading the wave of new luxury hotels is the 246-room Gran Hotel Manzana Kempinski La Habana, which stands in a restored European-style shopping arcade that stretches for a block. On the other side of Parque Central is the Hotel Inglaterra, which opened in 1875 and had Winston Churchill as one of its guests. Within shouting distance are several other luxury hotels managed by the French group Accor and Iberostar of Spain. Although the Cuban government owns all hotels in the country, heavy hitters in the luxury hotel world will help manage many of them. The Manzana, which is scheduled to open in early June, is financed by the Cuban state company Almest Investments and co-managed by the Swiss luxury hotelier Kempinski and the Gaviota Group of Cuba. The Inglaterra will be managed by Marriott International and is set to open in December 2019. Because United States regulations on visiting Cuba have not been completely relaxed, the full deluge of American visitors has not yet arrived. Instead of declaring themselves tourists, they must come under the auspices of one of 12 categories like “educational activities,” which include interactions with Cuban people. Former President Barack Obama’s visit to Cuba in 2016 paved the way for many of the changes in travel and hospitality. Priceline Group, an American company, received authorization afterward to allow travelers to book rooms directly through its Booking.com website, and Starwood Hotels and Resorts became the first American hotel company to enter Cuba in nearly 60 years. Starwood received permission to operate three hotels, including the Inglaterra. Starwood’s first hotel in Cuba, a state hotel rebranded as Four Points by Sheraton Havana, opened in June 2016 in the Miramar district of Havana, popular with diplomats and business travelers, about eight miles southwest of the Old Town. Last year, Starwood was acquired by Marriott International, which will now manage the former Starwood hotels. Marriott had also been authorized to manage properties in Cuba. But lengthy delays have tripped up many of the projects. 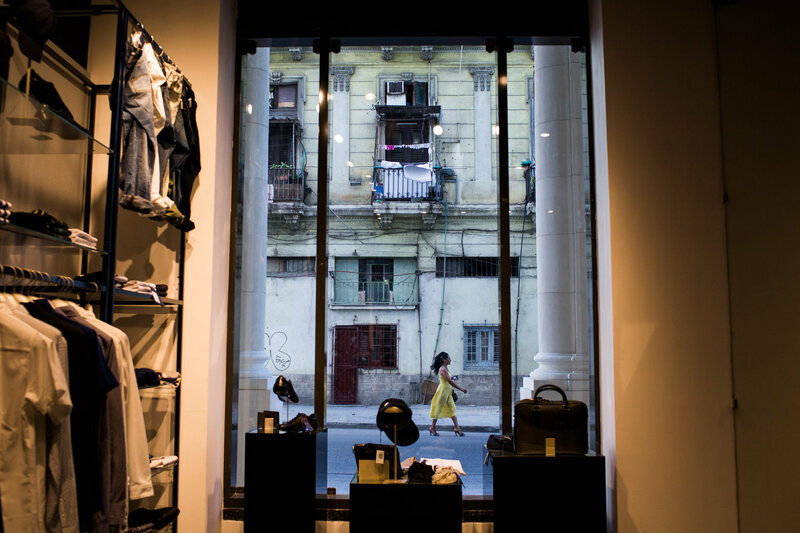 Navigating shortages — Cuba imports 70 to 80 percent of its food, according to the World Food Program — frequent electricity and internet outages, and a decrepit water and sewage system are just some of the headaches for hotels trying to maintain standards. And the area near Parque Central and much of Havana has been overtaken by poverty since the Cuban Revolution in the 1950s, creating an uncomfortable juxtaposition between struggling locals and wealthy visitors. Like many buildings in Havana, the Gran Hotel Manzana — originally the Manzana de Gómez — has a storied past. Built between 1890 and 1918, the shopping arcade housed high-end clothing boutiques, two theaters, restaurants, a skating rink and a shooting range. After the revolution, some stores remained on the first floor, while the other floors were taken over by the government for offices and schools. 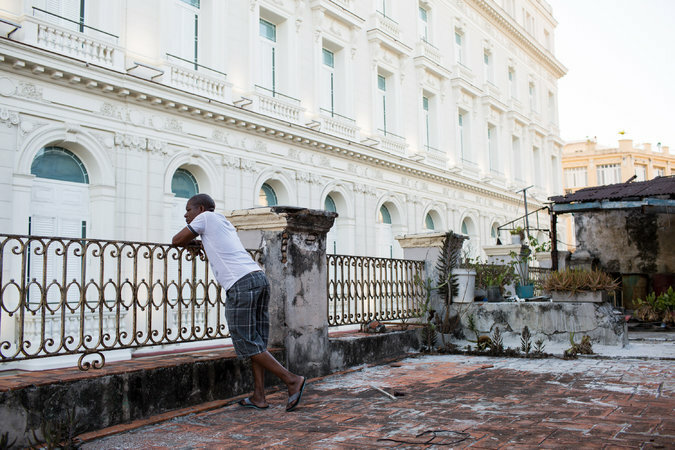 But in recent years, the building — like many others in Cuba — fell into disrepair. In 2012, the French construction company Bouygues Bâtiment International started renovations, and in 2014 Kempinski joined the project. Now the hotel has 18-foot ceilings, French windows and abundant Art Deco-style mirrors. 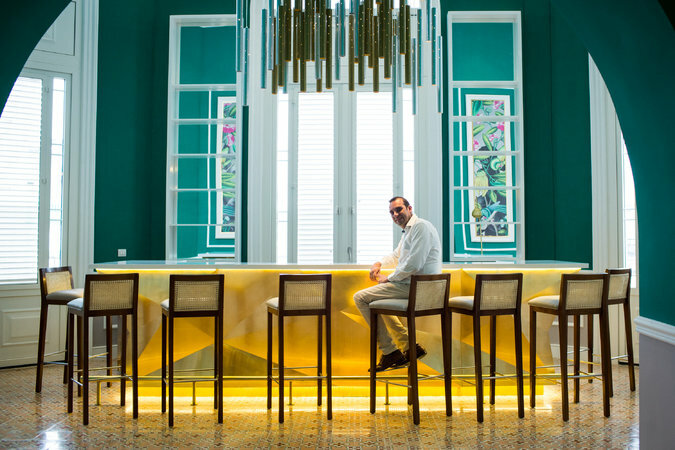 The design plays up Havana’s history with elements like the turquoise-and-gold Constante Bar, named after the bartender who came up with the Hemingway Daiquiri. From the Constante’s windows, guests can see El Floridita, one of Hemingway’s local watering holes (and where the drink was created). Rooms range in size from 430 to 1,615 square feet and will cost from $370 to $660 per night, according to Alessandro Benedetti, a director of Kempinski’s sales and marketing department. Five stories tall, the Manzana also has a rooftop terrace and swimming pool that offers views of the Great Theater of Havana Alicia Alonso, the National Museum’s Palace of Fine Arts and the Capitolio, a national government building that resembles the Capitol in Washington, though its architect is said to have modeled it on the Panthéon in Paris. The top floor also has a fitness area and spa that cover over 10,000 square feet. From the windows in the massage room, drying clothes can also be seen hanging from the broken windows of crumbling buildings nearby. This region of the city has been nicknamed “las sábanas blancas,” or “the white sheets,” for the laundry frequently seen fluttering in the breeze. Indeed, the building boom is also bringing into sharper relief the disparity between visitors and the average Cuban. Many Cubans work for the state and earn the equivalent of $25 to $30 a month. 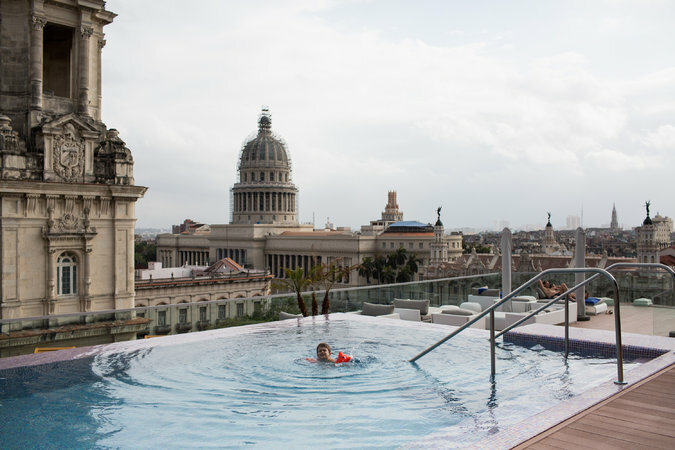 The ceiling on state employees’ salaries has been a challenge when hiring hospitality staff for these new luxury hotels in Havana. While it remains to be seen how tightly it will control private enterprise, the Cuban government is betting that tourism will help solve its economic woes. In 2016, the government declared a goal of 10 million visitors by 2030. The government is looking for new growth as the Cuban economy shrank 0.9 percent in 2016, hurt by the oil crisis in Venezuela, a key trading partner. The challenge will be avoiding the “Cancún-ification” of Cuba, said the architect and urban planner Miguel Coyula, referring to the resort area in Mexico that is a particularly popular destination for students on spring break. A version of this article appears in print on May 10, 2017, on Page B1 of the New York edition with the headline: Havana Gets a Face-Lift. Reservations can be made by contacting MARAZUL or directly on-line with the carriers. *GULFSTREAM WILL COLLECT ADDITIONAL $25 AT CHECK-IN (CUBAN DEPARTURE TAX) BAGGAGE: Gulfstream charges $20 per checked bag and $2 /lb over 44 lbs (including carry-on). Overweight and oversize charges apply for any bag exceeding 50 lbs and has linear dimensions more than 62 inches. Overweight limit per bag of 100 lbs and 126 linear inches. First and second bags are free for passengers in first class, business, or with elite status. IMPORTANT; from Nov 19-Jan 6, 2017, excess, oversize, and overweight luggage and boxes will not be accepted. Baggage policy: One bag free up to 50 lbs. Overweight charge for 50-70 lbs. Up to 64 linear inches. Overweigh charge for 64-84 linear inches. No one piece of luggage should weigh more than 60 lbs. Costs do NOT include taxes paid in Mexico ONLY IF the passenger is staying more than 24 hours in Mexico:$27 Mexican Airport Tax + $20 Mexican Immigration Tax.